The fundamentals of opening a fine dining restaurant follow those of opening any restaurant — a solid business plan, funding, permits, and licenses. Beyond these basic tasks, successfully creating a fine dining experience requires impeccable attention to detail, from the atmosphere to the food to the service. Fine dining on your terms. Fine dining is a subjective term. What some consider fine dining, others consider casual. Not all fine dining is tablecloths and frilly napkins — many of the highest-rated restaurants in the country are characterized by a sleek, simple design. The definition of fine dining is a restaurant concept offering patrons the finest in food, service, and atmosphere. So while your concept should clearly and consistently define your vision, it need not fit a specific mold. It should seek to earn and keep a place of distinction among restaurants in your area by meeting these criteria every day, in every way. Select a location. Location is integral to the success of any restaurant. One benefit afforded to fine dining restaurants which others seldom enjoy is that of having a bit more leeway in location choice. 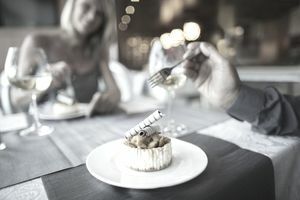 Fine dining restaurants are full-suite experiences — dinner reservations are often made weeks or months in advance and patrons are willing to drive to get there. Converted buildings such as barns, older homes, and other unique structures are great locations for fine dining restaurants. Create a fine dining menu. Your menu should set you apart from — above — the competition. Many fine dining restaurants feature a prix fixe menu, while others mix a standard menu with nightly specials. Your menu should be presented in an elegant form and printed on good quality paper. Purchase equipment. Equipment purchased for the kitchen should reflect the requirements set by the menu. Freshly prepared produce, homemade desserts, and bread are often hallmarks of a fine dining experience so adequate, functional space to store and prepare these foods is a necessary consideration. While all restaurants require specific commercial equipment, fine dining restaurants must also consider plates, glassware, flatware, linens, and furniture to best compliment the restaurant's overall ambiance. Hire a well-trained staff. Good service staff is worth its weight in gold in providing apex service. Service staff should be able to present the menu by rote, and should always have food and drink recommendations at the ready, should customers ask. A head chef exemplifying experience and passion for great food — someone inspired to create new, unique dishes and who inspires kitchen staff toward the same level of excellence — will become the linchpin of your restaurant's success. Connect with local farms. Organic, local fare isn’t just better for the environment and the local economy. It tastes better, looks better and provides a greater sense of connection to the food and the experience for your clientele, as well. Set up a reservation system. You can choose to have seating — that is, the first round of guests is seated at 5:30, the next round at 7:30. This allows better order flow control into the kitchen. Defining a table hold policy early on will be important as well. Partner with other local businesses. Reach out to local businesses whose clientele fit a fine dining demographic. Partnering with bed & breakfasts, resorts, and hotels to offer package deals for people seeking weekend getaways can be a solid resource of exposure.